HomeWho Is Your Drill Sergeant? 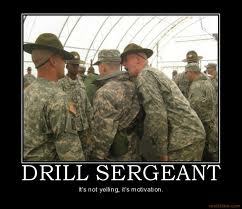 Who Is Your Drill Sergeant? Keep on keeping on. Prod yourself. When the going gets tough, the tough gets going. If it’s ever going to get done, then I have to do it. Go, Go, Go. Go, Go, Go. Move it, move it, move it…move it, move it, move it. One, two, three, four…one, two, three, four. Push it, push it, push it. Drive yourself. Focus, focus, focus. Concentrate, concentrate, concentrate. Energize yourself. Do it, do it, do it. Practice, practice, practice. Take care of it. Work it, work it, work it. Hard work never killed anyone. Be diligent. Go for the gold. Can’t quit now, almost there. Kick it. Jump start it. Make it move. How sweet it is. Keep going. We are closer today then yesterday. The busy bee earns its honey. Work the plan. Never, never, never give up. Success is 1% inspiration and 99% perspiration. OK, second wind. Let’s do it again. Keep on keeping on. Prod thyself. When the going gets tough, the tough gets going. If it’s ever going to get done, then I have to do it. Go, Go, Go. Go, Go, Go. Move it, move it, move it…move it, move it, move it. One, two, three, four. ..one, two, three, four. Push it, push it, push it. Drive yourself. Focus, focus, focus. Concentrate, concentrate, concentrate. Energize yourself. Do it, do it, do it. Practice, practice, practice. Take care of it. Work it, work it, work it. Hard work never killed anyone. Be diligent. Go for the gold. Can’t quit now, almost there. Kick it. Jump start it. Make it move. How sweet it is. Keep going. We are closer today then yesterday. The busy bee earns its honey. Work the plan. Never, never, never give up. Success is 1% inspiration and 99% perspiration. OK, third wind. Let’s do it again. Keep on keeping on. Prod thyself. When the going gets tough, the tough gets going. If it’s ever going to get done, then I have to do it. Go, Go, Go. Go, Go, Go. Move it, move it, move it…move it, move it, move it. One, two, three, four. ..one, two, three, four. Push it, push it, push it. Drive yourself. Focus, focus, focus. Concentrate, concentrate, concentrate. Energize yourself. Do it, do it, do it. Practice, practice, practice. Take care of it. Work it, work it, work it. Hard work never killed anyone. Be diligent. Go for the gold. Can’t quit now, almost there. Kick it. Jump start it. Make it move. How sweet it is. Keep going. We are closer today then yesterday. The busy bee earns its honey. Work the plan. Never, never, never give up. Success is 1% inspiration and 99% perspiration. OK, take a deep breath. Let’s do it again. Get the point?! Oh Great Dad, You are our strength. You are our hope. You are our mentor. When times become difficult; when circumstances causes us pain; when we feel like giving up and quitting, it is you who we look to for help. Help us keep our eyes focused on you. 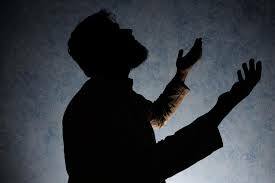 Help us to keep our prayer life alive with your Holy Spirit. Help us to keep our involvement in your Word on a personal level. Help us to keep our heart, mind, and soul diligently immersed in you. Help us to keep, keeping on. When we become tired and want to quit, regenerate us. Let your passion for life exude in us and through us. Let us live life with your energy. Let nothing come between us. Help us to glorify you in everything we do. In Jesus we ask. Amen.